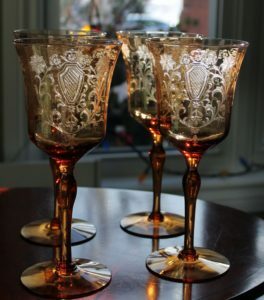 I saw these online and liked the colour and the unique etch. They are very striking looking ‘in person’. The amber colour is very rich. 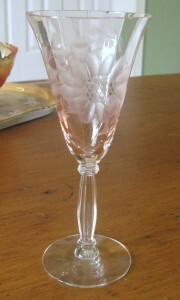 While the smaller pieces are not as popular as the larger water goblets, they came as a set. 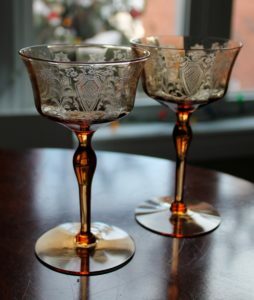 I think they would be perfect for sipping a cocktail! I haven’t picked up any pink Corn Flower for awhile but these pieces were irresistible. I am not sure what the blank is, likely European. I got very very own Christmas copy, from my thoughtful daughter, of Cornflower – Canadian Identification & Price Guide to W.J. 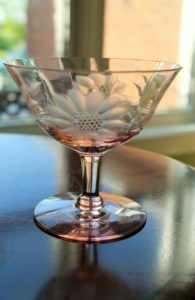 Hughes Corn Flower Glass by Krista A. Taylor. Between the three books that I now own, there is a world of photos and information about the glassware decorated by the Hughes Company. A different kind of update to the original post of May 7, 2012. Thought I’d put my new pink glasses with my old pink glasses. I think these are also Tiffin blanks – #020. They hold 4 ounces and are a flat footed tumbler. The pink is very pretty. I’ve come across two other books about Cornflower – Canadian Identification & Price Guide to W.J. 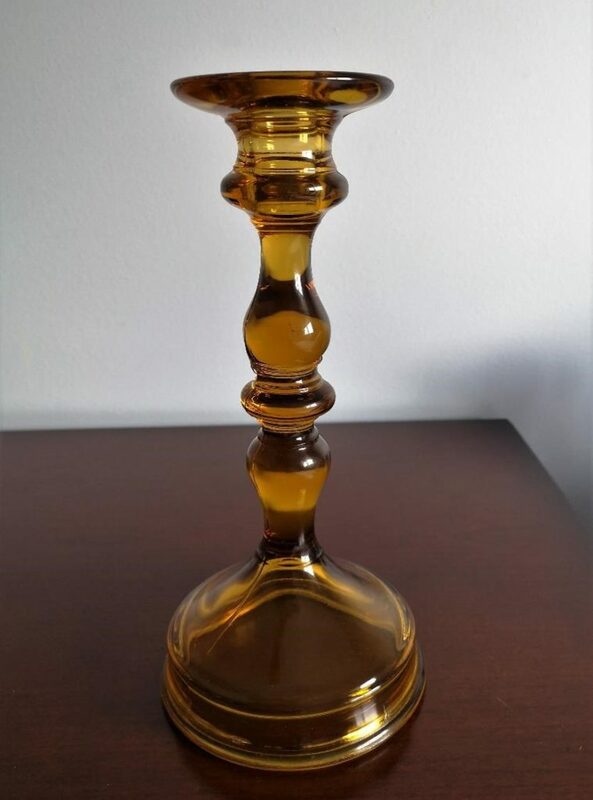 Hughes Corn Flower Glass by Krista A. Taylor and Elegant Glass with Corn Flower: Imperial Candlewick, Heisey, Tiffin & More by Walter T. Lemiski. Both filled with information and photos. Since posting this piece I’ve been doing some reading in my book – Corn Flower: creatively Canadian by Wayne Townsend. It’s a pretty interesting read. Anyway I discovered that the blank for the Corn Flower cut is a Tiffin blank – #15024. Hughes imported different blanks from different companies, obviously including Tiffin. Mr. Townsend says that Tiffin’s ‘marketing geniuses’ gave their products interesting names. So…this blank may not just simply be ‘pink’ but may be the colour ‘Rose Pink’ used by Tiffin. Also reads as though this blank was acquired by Hughes in the thirties. If you run a search on replacements.com, on the blank, you see that Tiffin had etched it with a number of their own patterns. On a page with the Flanders etch the date range is 1927-1935. So….these pretty glasses are likely a bit older than I had thought. I’ve already shown a piece of Cornflower, but there are others to come. These pieces are special however. 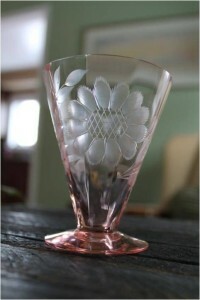 My lovely, gracious and elegant mother-in-law was the person who sparked my interest in glass. She collected many different things. Although I don`t think glass was a particular interest, she had some very pretty pieces. My daughter was given this, and four other like stems, by her auntie. She didn’t want to be responsible for their care, so she gave them to me for safekeeping. I’d never seen these at her Nana`s house. In fact I’d never seen any Cornflower pieces. So I was surprised to see these. The surprise was doubled by the fact that the bowls of these stems are the most beautiful pink. I’ve seen many pieces of Cornflower, but never in pink. It is difficult through these photos to really gauge the delicacy of the colour. They are very, very pretty. I’ve purchased a book on Cornflower, but I have to admit I haven’t really read it yet. I do want to find out more about the pink pieces. These pieces will never be for sale by me. At some point I am certain that my daughter will want them back. Although there are some chips, they will still beautifully grace a table….and remind her of her Nana.